An insightful and heartwarming novel about families, love lost and found, and a three-legged dog named Nelson who brings them all together. Born under a sparkling crescent moon, Nelson is a bright-eyed, inquisitive half beagle, half poodle. He lives with Katey and Don, newlyweds whose marriage is straining under the pressures of domesticity, but Katey's devotion to Nelson buoys the pup even as he worries his home may be falling apart. But there are few things Nelson likes better than to follow a scent, and one day he follows his nose and gets lost...very lost. Though he searches frantically for Katey—and she for him—Nelson can't seem to find his way home, and he soon realizes that if he's ever to see his great love again, he must make his way on his own and try to survive in the wild. Much more than the story of one dog's incredible journey, this is a deeply moving story of survival and enduring love, which once again confirms the unbreakable bond between humans and their best friends. 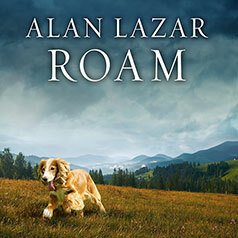 In the tradition of The Art of Racing in the Rain and The Story of Edgar Sawtelle, Roam is an unforgettable tale of love lost and found, the trials that test families, and an affirmation that no matter how far or how long you may travel, there's always a place you can call home. This audiobook includes a seven-part piano soundtrack written by the author especially for Roam. Each part comes at the end of the chapter for which it was composed.